The Scholastic Art & Writing Awards have an impressive legacy dating back to 1923, when Scholastic Founder, Robbie Robinson, started the program as a way to honor the creative achievement of high school students. Some things have changed with the Awards over the years—new categories like Comic Art and Video Game Design—but a few things have not. Originality; Technical Skill; and the Emergence of a Personal Voice or Vision. The Scholastic Awards place a high priority on work that challenges boundaries and can communicate new and interesting ideas. A noteworthy roster of artists and writers earned Scholastic Awards as teenagers including: Andy Warhol, Sylvia Plath, Truman Capote, Lena Dunham, Robert Redford, Joyce Carol Oates, Lena Dunham and many more. SKyPAC serves as the South Central Kentucky affiliate for the Scholastic Art & Writing Awards. JUROR 1: First I would like to thank Andee Rudloff and SKyPAC for allowing me the opportunity to juror the 2018 Scholastic Art & Writing Awards for the South Central Kentucky Region. There were many exceptional artistic examples of the talent that persists in South Central Kentucky. The individual contributions and support by their teachers provided a large number of entries, which demonstrates the importance, vitality, and strength of arts in the hearts of my fellow Kentuckians. We, the jurying committee, spent hours viewing, contemplating, discussing and selecting works towards Honorable mentions to Silver and Gold Keys. We absolutely enjoyed exploring the voices and talents of the next generation of artist. Seeing the range of investigations and successes of so many leaves me with little doubt that the expanding voice of artists and writers can bring about reputable change to our culture. I optimistically look forward to seeing the artist and works proceed to the next levels of national recognition. JUROR 2: It was a privilege to help jury the Scholastic Awards. Works I believe to be exceptional stood out because of the time and thought artists put into their pieces, which show great originality, technical skill, and personal voice. Artworks recognized with Gold Keys are strong in all three areas and ranked best in their category. Some of these works use visual language and materials to elevate ordinary subject matter such as flowers. Others grapple with social issues of our time or create imaginative works filled with symbols. I was impressed by those ambitious seniors who submitted portfolios of unified bodies of work with creativity, a personal vision, and exceptional command of the chosen medium. Congratulations to all artists who submitted visual art to the 2018 Scholastic Awards! JUROR 3: The artworks awarded today exhibited strong personal voice, sound technical skills and exceptional creativity. Although it was difficult to decide our winners due to the excellent talent we had entered into the competition this year. I had a wonderful time participating in this process. JUROR 4: The creativity and works we reviewed were impressive in their skill level, range of content, and unique artistic visions. The overall quality of all the students’ work was wonderful, which made it so difficult to choose winners. I thoroughly enjoyed being part of this process. JUROR 5: My experience serving as Juror for Scholastic Arts and Writing Competition was one of honor and also great concern that I represent the creative work of youth writers as objectively as I can. As a writer myself, I appreciate the stages of writing in the submitted works, the earnestness of each one. If I can add light to anyone’s writing path, I’ll begin to return the mentoring I have received along my writing path. The work of creating, especially writing, is a solitary endeavor. Nothing helps the budding soul of an artist more than encouragement. Thanks for including me in this wonderful endeavor. I am very pleased to see talent emerging among the youth of our region. 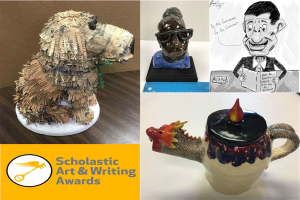 We want thank the individuals who instructed, mentored, encouraged, and perhaps even nudged or required students to submit their artwork to this year’s Scholastic Art & Writing Awards. Educators please know that not only do your students rely on you, but we do, too. Thank you! For Gold Key works of art and writing in the Awards’ 29 categories, including architecture, painting, flash fiction, poetry, printmaking, video game design, and more, the opportunities for recognition will continue when the works are adjudicated again on a national level by a panel of leading creative professionals. National Gold Medalists will be announced on March 13th, 2018, and will be honored during a special awards ceremony at the world-famous Carnegie Hall in New York City in June 2018. All National Medalists are eligible for a wealth of additional opportunities such as inclusion in the Art.Write.Now.Tour traveling exhibition and The Best Teen Writing anthology. National Medalist poets are considered for the National Student Poets Program, the nation’s highest honor for young poets presenting original work. A complete list of 2018 regional Gold Key Scholastic Art & Writing Awards recipients is available online at artandwriting.org. Every year, SKyPAC has the opportunity to recognize the exceptional work of students from seventh to twelfth grade in almost 30 categories of art and writing. Young artists from throughout the south central region of Kentucky have their artworks adjudicated, with the top winners earning a spot in a gallery at SKyPAC. This year, SKyPAC received almost 600 individual entries and awarding a total of 25 Gold Keys and 36 Silver Keys and 61 Honorable Mentions for outstanding work including 6 American Voices nominees. All awarded works are on display at SKyPAC throughout the month of February and March 2018.